Regardless of where in the digital world you belong, conversion is the top-rated, gold-covered keyword flashing before your eyes from the moment you sit down at your desk in the morning, to the moment you close your eyes at night. 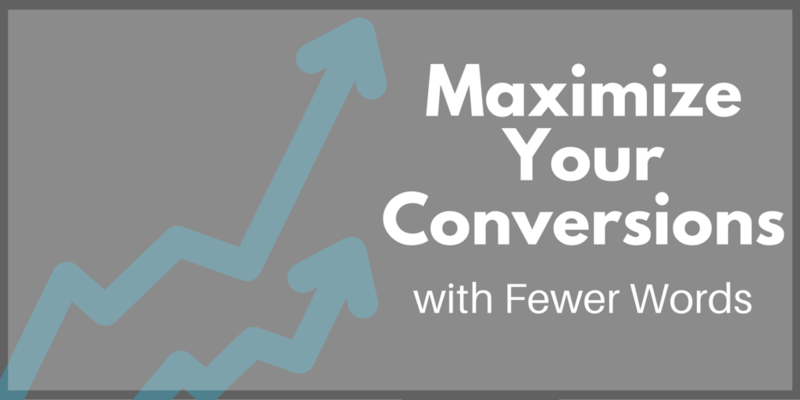 Maximizing conversions has become the ultimate Holy Grail of the digital world. From SEOs to copywriters and from designers to developers, we’re all aiming for the same shiny goal: to attract and convince our websites’ visitors. For a good marketer, it should be no breaking news that words and conversions are tightly interconnected. Yes, you need spectacular designs and functional websites, with proper optimization and quality branding. But, in the end, it all narrows down to the words you use to make your readers believe in you. To make them trust your product and purchase it as well. …And it all starts with a good headline. Diversity is one of the most beautiful parts of digital marketing. While in the traditional world most rules have already been established, online marketing is still shaping itself – which means that, at the moment, we are faced with a flood of different ideas and theories. Headlines101 makes no exception to this. In fact, headlines and their length may be among the most highly debated concepts in conversion maximization. Some people say very short headlines work best (5 words at the most), some believe in middle-length titles, and others create long, winding copy (which sometimes borders on the odd side of things). I tend to lean towards those who keep their headlines shorter. Long titles can be attractive and entertaining, but they generally fit certain types of articles that are not always B2B-focused (e.g. Elite Daily, UpWorthy, and so on). From a SEO point of view, short headlines are always the best – especially since Google doesn’t “see” more than 65 characters in title tags. Even so, a study released by Schwartz MSL has shown that a lot of professionals do not confine their headlines to the 65-character limit. In fact, only approximately 21% of the headlines analyzed under this study were shorter than 65 words (which is still 2% more than in the previous year). Short titles tend to go a long way not only in the digital world, but in the academic environment too. According to a study conducted at the University of Warwick, UK, short titles seem to be prioritized by academic writers too. When 140,000 paper titles were tested, the study found that those with shorter headlines also got more citations. Of course, this may depend on a lot of factors (such as popular publishing journals imposing a word limit on the titles of the papers published there) – but it is definitely worth taking into consideration. Why Are Shorter Headlines More Likely to Succeed? The first (and probably most important) reason I think short headlines are more successful is due to a very simple fact: people don’t actually read online. They skim. They open a page, are instantly struck by its design and then skim through the headline and subheads to find something that interests them. According to CrazyEgg, only 20% of the Internet users read the articles – the other 80% read the headlines alone. Unless your website’s users are interested in articles that are not necessarily actionable (e.g. motivational or entertaining articles), you should stick to a shorter headline. In general, people searching for solutions will not stop at articles that are longwinded and too rich in detail. They will stop, however, at articles that seem short, but are packed with information and meaning. Beware, though. Going too short with your headlines may not have the great impact you’re aiming for either. In fact, according to a study made by NewsWhip, some of the largest websites use headlines that are somewhere in between 7 and 12 words. For example, Mashable records on average, 1,935 interactions and their titles are of approximately 8 words. 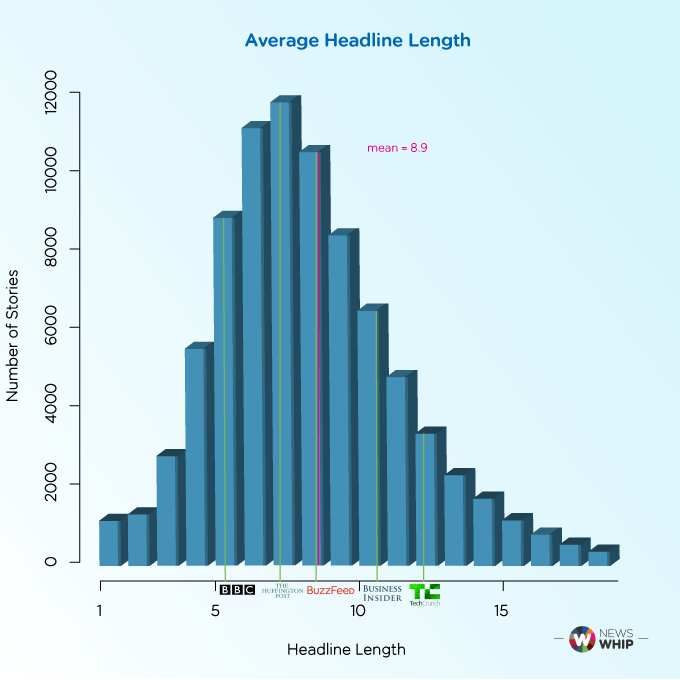 Furthermore, as you can see in the NewsWhip graph below, headlines with less than 5 words perform almost as poorly as those that are of more than 15 words. Here’s another very interesting theory. According to George A. Miller, one of the first big names in cognitive psychology, the human brain cannot hold in “working memory” more than 7 words (+/- 2). In other words, most of your site’s users will not even pay actual attention to headlines that are much longer than that. This would explain why average-length headlines perform better when it comes to click-through rate and interaction. So, How to Craft Short Headlines That Sell? Contrary to what some people may believe, crafting headlines that are short but compelling is not that easy. This is mostly because you are probably trying to send a complex message. As a consequence, you might feel that it’s necessary to use more words to make sure your ideas are clear. However, that’s not entirely accurate. As mentioned before, there are articles for which longer headlines are necessary. However, they aren’t longer because the message cannot be sent in a compressed form, but rather it’s because the writer behind them is following a specific style (very “oral” and very informal). 1. Think of what you want to say in your headline. Write it down. 2. Now, think of how you can put it in a shorter form. Write this down as well. 3. Make it even shorter. Think of powerful words that convey just the right message. If needed, use a dictionary to search for the precise meaning you need for your headline. I like using Thesaurus because it provides a wide range of synonyms and that can be filtered by length, complexity and how “close” they are to the original word. Don’t limit yourself to synonyms only. Think of words that can compress the meaning of your message and that are specific to a particular industry too. 4. Make sure you don’t use spammy words. Certain words considered to be spammy might actually put off a lot of users. Although the rules of using (or not using) these are not nailed, it is usually better to avoid them (especially in email subject lines, where spam detectors may instantly toss your email to the Trash folder). Here is a very good list of words you should use as rarely as possible. 5. If your original message is too long, it’s most likely because you’re not trying to communicate one thing alone. Take a good look at what you wrote down at #1 and split your message in two (and use the same steps as described above for each of them). The first one will be your headline, while the second one will be your subhead. 6. Check your headline using an automated tool. This is more of an optional step, but you can take it anyway. Use your common sense when analyzing the results, though – you should write for humans and automated tools are the exact opposite of that. 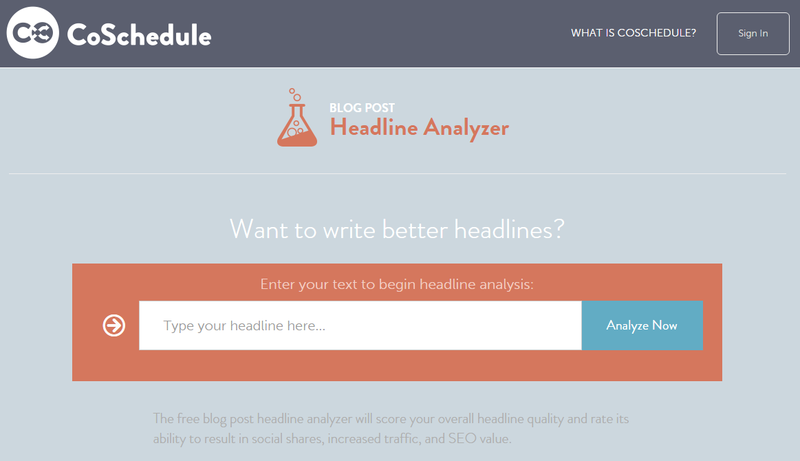 When I use automated tools for my headlines, I usually go for CoSchedule’s Headline Analyzer. It’s easy to use and it helps me stick to a lower number of words, as well as determine how powerful my headlines are. Remember, these are just some basic guidelines to help you craft better headlines, not absolute “gold nuggets” to follow (as mentioned before, there is no such thing). Have patience, write and re-write, test to see which headlines perform better for your site and you will soon be a true Guru of the digital copywriting and content writing world. Got fresh data on organic CTR? Check out this interactive chart to see how organic CTR may vary for your rankings. No login required!